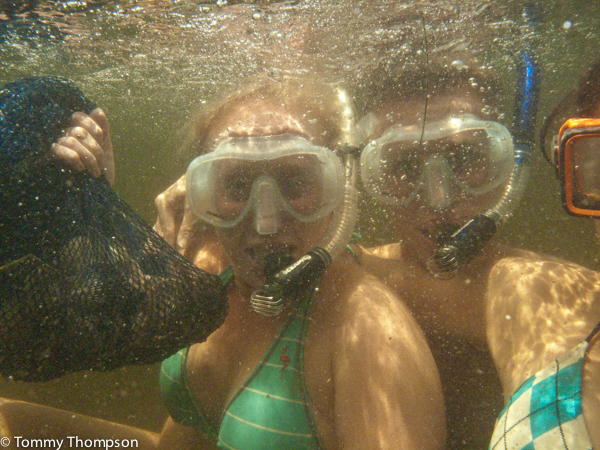 Scalloping is the Natural North Florida’s alternative to South Florida’s lobster season. 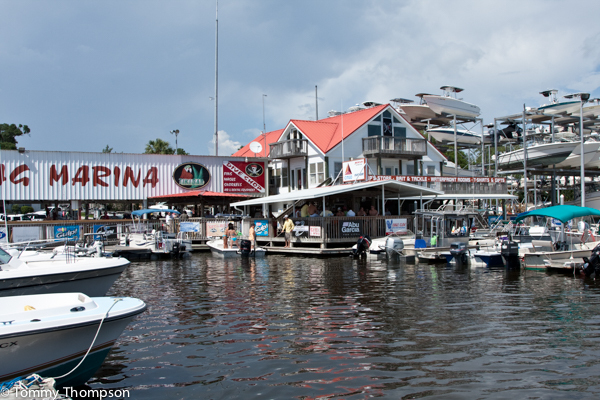 It’s a combination of complete madness at boat ramps and marinas, motels filled to capacity, family fun, and some of the best eating around. Here is our comprehensive guide to scalloping in Natural North Florida to prepare you for the upcoming season. Read on to discover how to get out on the Gulf and catch your own delicious dinner. Bay scallops are legal game in the Gulf from June 25 until September 25, 2016 and our ports between Horseshoe Beach and St. Marks are busy with scallopers. That’s a shorter season than the one for lobsters, but, while it lasts, it’s just about as much fun as you and your family can have. Scallops seem to be predictable, and there are generally reliable pre-season reports as to their availability from flats anglers as well as from researchers at the Florida Fish and Wildlife Research Institute. It seems that with the increased development of the Gulf coast that the best spots to scallop are in the least populated areas, in particular the coastline between Steinhatchee, Keaton Beach and St. Marks. In the not-too-distant past, scalloping was popular well south into parts of Pinellas County, but as human population, and its affect on water quality has increased, the scallops have retreated northward, away from civilization. Our untouched and relatively undeveloped coastline offers the perfect bay scallop habitat. Scallops move, too. One day they’ll be found in the clear water next to shore; the next they’ll be in 8-feet of water on banks far offshore. For example, the 2013 season found them close-in Dixie County’s Pepperfish Keys. However, in 2014 they were plentiful only in deeper water on the Nine-Mile Bank off Steinhatchee. No matter the depth, scallops are not hard to find, and the more they gather in one spot (A part of their reproduction cycle.) the better catches folks bring back to the dock. 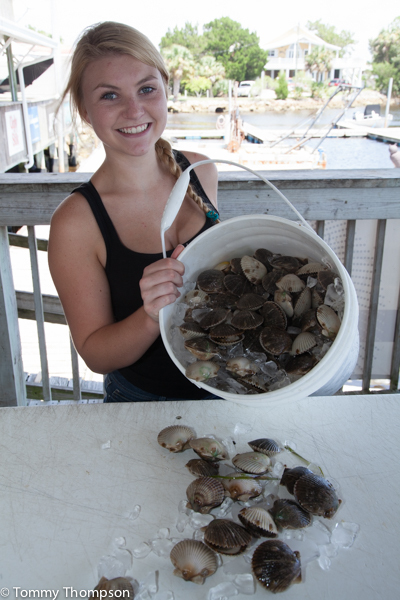 If you’re the first boat out of port on the first day of scallop season, you probably need to pay attention to reports from marinas and local newspapers or television as to the location of the best potential areas. If you’re the first boat out of port on June 26 (Day 2), just look for the fleet! Once you’re in the scallops’ neighborhood, you’ll need to do a little bit of searching, just to make anchoring worthwhile. Hopefully the water will be clear (Scallops like it this way.) and you can position a couple of ‘spotters’ to look for scallops with their light sides turned upwards. 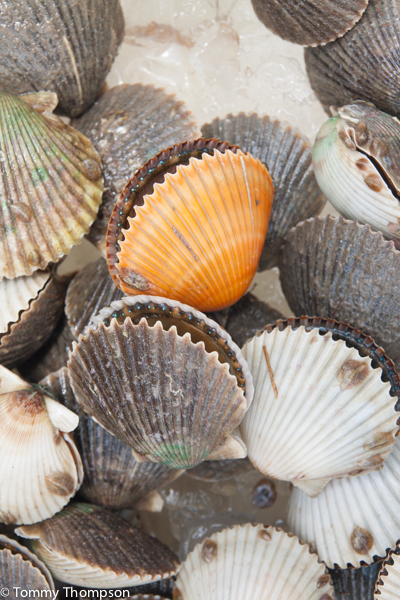 While most scallops are found with their dark sides upward to the surface of the water, a few tend to settle on the bottom flipped over, making it easy for boaters to spot them. If you see a few light or colored shells, that’s a good sign that there are more scallops nearby. If you’re in dark or deep water, you’ll more than likely need to get a crew member overboard to take a closer look before you commit to that particular spot. Keep a person aboard the boat at all times and instruct your scallopers that his or her word is ‘law.’ Crowds of scallopers don’t seem to scare away sharks, and the word from the Captain to get out of the water should be taken seriously. Also, good common sense tells most people that cleaning scallops aboard and then throwing the offal into the water near snorkelers is well outside the range of good judgment. Most people, that is. Your lookout should also keep a ‘head count’ of everyone in the water and alert folks, particularly children, lest they drift or swim too far from the boat. If it’s your first time scalloping, you’ll need to make a trip to a local dive or tackle shop and pick up a few necessities. The aforementioned dive flag should be the first thing on your list, and mesh bags second. I’d advise getting bags in bright colors as black ones tend to get lost on the bottom if dropped. 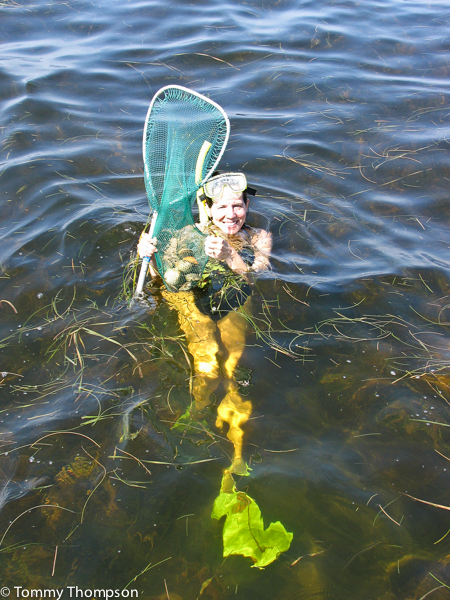 If you think you’ll be scalloping in waist-deep water you may not need anything other than a mask and comfortable wading shoes, but when the scallops get deeper where the tidal currents are strong you’ll certainly want to consider investing in swim fins and snorkels for everyone in your party. I also carry a 5-gallon bucket that’s been marked in 2-gallon increments. Individuals are limited to 2 gallons of scallops in their shells. Boat limits are 10 gallons total, even if you have more than 5 persons aboard. Take care to measure your catch carefully, as Florida Fish and Wildlife Conservation Commission law enforcement is out in force during scallop season, and they take bag limits of this precious resource very seriously. A 2-gallon individual limit will yield about a pint of cleaned meat. Unlike oysters, where you eat the entire animal, scallops are taken only for their adductor muscles (Those which open and close the shell.). Adductor sizes vary somewhat, and limits seem to have a higher yield towards the end of the season. If you don’t own a boat, there are options to joining the harvest. Rental boats are available at many marinas, including Steinhatchee’s Sea Hag Marina, Good Times Marina, River Haven Marina and Ideal Marine. Shell Island Fish Camp at St. Marks is also a good source for rental boats. And many local fishing guides turn their attention away from fin fish during scallop season to take visitors on scallop outings and adventures. Check out the guides’ listings on the websites of the marinas linked above or contact the marinas directly for recommendations. Scallop catching isn’t hard once they’re found. The hardest part for inexperienced snorkelers is using the equipment, but after a few minutes, even novices get the hang of timing their breaths and dives. While some scallops are easy to see, particularly if their light sides are facing upwards and they’re laying on top of the grass, most scallops are not immediately visible, and are snuggled down in the grass, dark side up. Finding an area with shorter grass and spotty white sand areas is preferred, and if you find yourself in such an area, your catch rate will be faster. Look carefully along the edges of white sandy patches and you’ll probably do better than if you are in grassy dark areas. If you do end up in an area of long ‘turtle grass’ try approaching the grass with the tide running directly towards you. That way, you’ll be able to look under the bending grass and will have a better chance of seeing the scallops. Mid-day times on sunny days help, too. Tides don’t really make a difference as to whether the scallops are there, but picking them will be easier in slow-moving currents. You will notice that scallops move with the tides and that an area you scoured can be re-populated in a matter of an hour or so when there’s current. 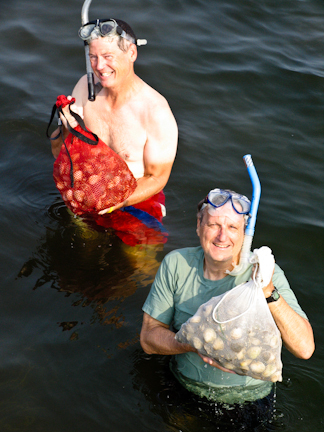 Pick them up by hand or with a dip net as you find them and pop them into your dive bag, but be sure to pull the bag’s drawstring, as scallops will occasionally swim and escape. Scallops don’t bite so handling them is easy. Take them back to the boat frequently, measure your catch and get them on ice immediately. It’s worth mentioning the hazards of scalloping. Scallopers should be award of sea urchins and take care not to grab or step on one. Stingrays are plentiful but harmless unless stepped on and late summer always brings hordes of stinging jellyfish. Be wary, but don’t let these marine threats spoil your trip. On a more serious note is weather. Hot summer afternoons almost always fuel big thunderstorms. Keep your eyes open and keep listening to the radio. Be prepared to haul anchor and run towards safer waters should the sounds of thunder approach. Scalloping is not big game fishing. nor does it involve specialized skills, knowledge or tackle. 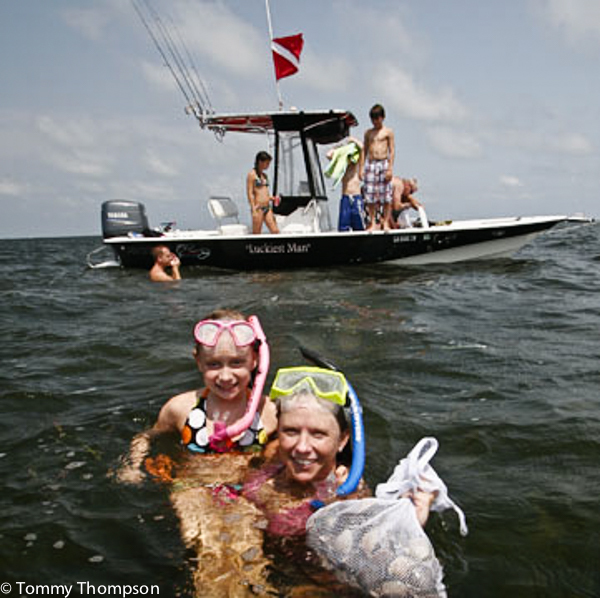 Scalloping is a fun day on the water for the entire family. The little kids can swim close to the boat, the bigger ones can pick scallops and look at starfish and small fish, and the adults can scallop, swim or just enjoy each other’s company. Followed by a dinner that night of freshly caught scallops, life “ain’t too bad”! Cleaning your scallop catch is a messy job. Plain and simple. 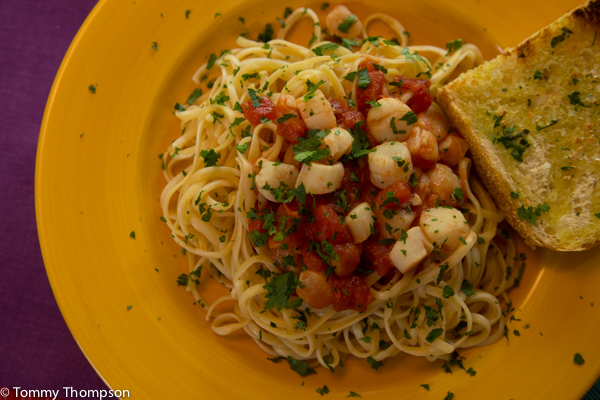 Simple gear works well for cleaning your catch of bay scallops. First, get your catch on ice as soon as it comes aboard. Be sure to cover the shells with ice and let them sit for a while. If you plan to clean your catch aboard the boat, take a break for lunch while they’re cooling, and the shells will open automatically. This takes at least one step out of the cleaning process, and prying shells open is no small chore. Second, holding the scallop in the palm of one hand, insert your cleaning tool into the shell and cut the muscle away from one half. Then carefully scrape the guts away from around the muscle, discard the guts, and use your tool to cut the muscle into a container. Do it again—and again! Everyone seems to have his or her favorite scallop-cleaning tool. I prefer a cheap stainless steel tablespoon, its front edge sharpened with a bench grinder. Others use traditional oyster knives, but I think that’s overkill for these small shells. Then there’s the ‘Shop Vac’ method. I’ve seen it done—sucking the guts out of scallop shells with a vacuum cleaner, but I’ve never been in attendance to see the final cleanup of the machinery. I can imagine. 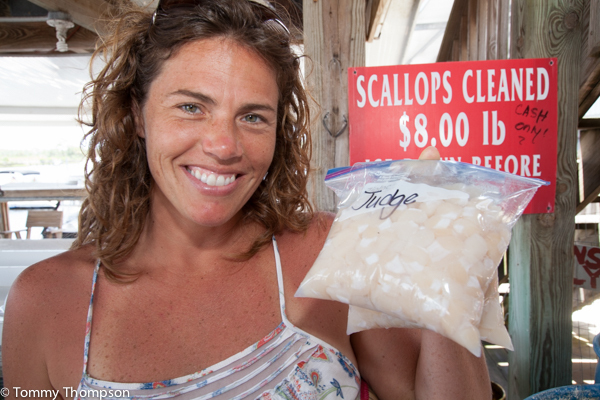 At Steinhatchee, at least, there is a great service provided by freelance scallop cleaners. These folks are usually available at marinas during the height of the scallop season to clean your catch for you. 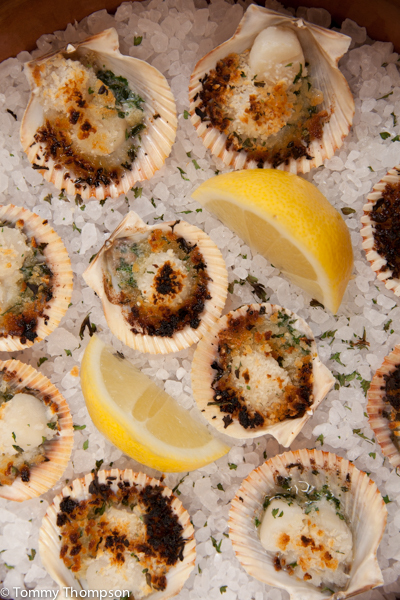 It’s simply a matter of getting your cooler of scallops in line for them to clean. Get there early, as lines get long after lunch and they’ve been known to clean scallops all night long. Prices vary, but the rates (based on weight or volume) are quite reasonable. Each bay scallop produces just a small bite of meat, and it’s one that should be savored. 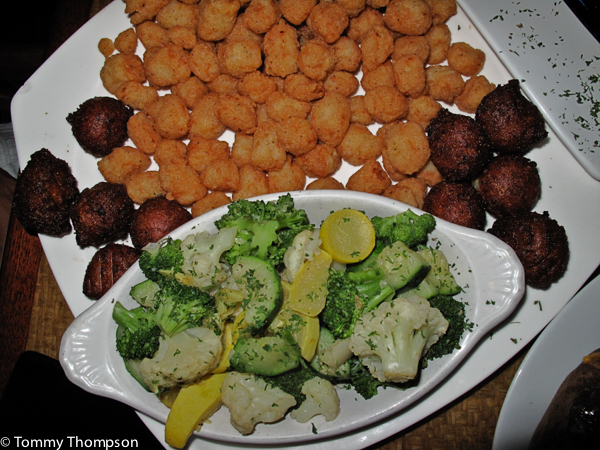 I suppose the most popular way scallops are eaten by Floridians is fried. Fried is fine, but scallops should never be battered. A very light coating of commercial fish breading or plain corn flour (Masa Harina at Latin grocery stores.) and a quick trip into 375-degree peanut or canola oil will produce a tasty result. Don’t drop too many into the oil at a time though, as you’ll end up with a soggy coating. Also, don’t overcook scallops. Let them fry until the centers are barely hot, drain them on paper towels, and get them to the table right away. One option is to toss scallops, without flour, in melted butter and then broil them in the oven for a couple of minutes. Then stir them into pasta with garlic and olive oil. A sophisticated, safer and more time-consuming approach to eating freshly shucked scallops is to ‘cook’ them in a marinade and serve them as a salad. 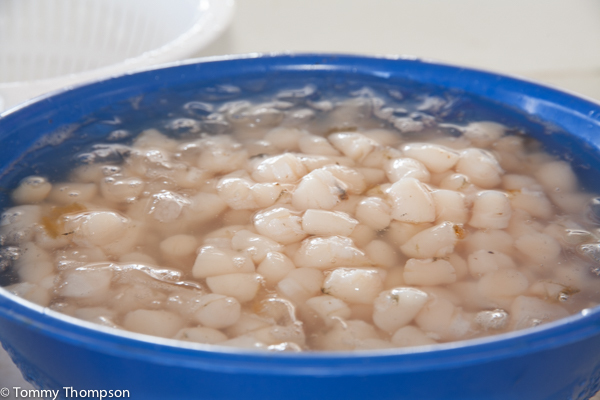 Scallops prepared as a ceviche have been pickled, in a sense, and are delicious. Mix all the ingredients for the marinade in a zipper-style bag. You can refrigerate this marinade for a day of so, if necessary. Two hours before serving, add the scallops and mix. 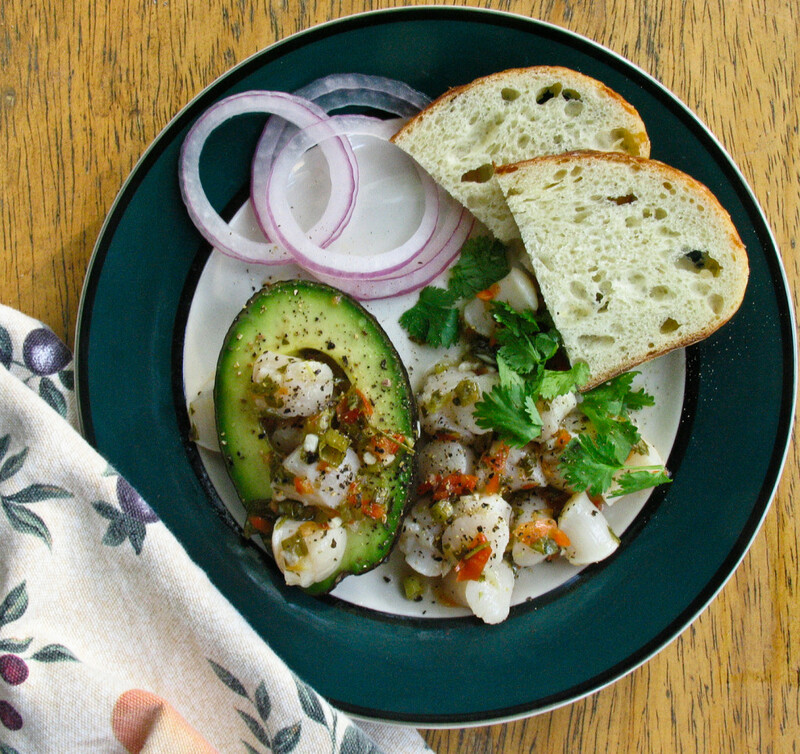 Drain away the excess juices and assemble the ceviche over salad greens or an avocado half. Touch everything off with a garnish with cilantro leaves. Dinner is served. A meal of fresh bay scallops, no matter how they’re prepared, is perfect way to end the perfect day on the water with the family. *Eating uncooked seafood has its risks. Always consult a medical professional regarding your personal situation before eating uncooked seafood. Scallop season often means busy marinas, long lines at restaurants and “no vacancy” signs at even the smallest of motels and rental homes near our major scallop ports. 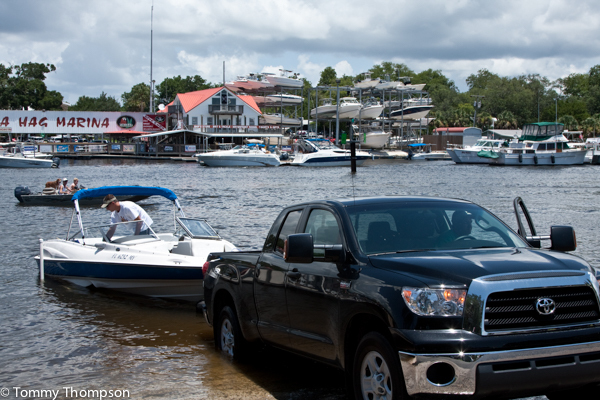 At Steinhatchee, the favorite restaurants are Fiddler‘s, Roy’s and Who Dat Bar and Grill. but there are less-fancy options like Hungry Howie’s Pizza (with dockage! ), Lynn-Rich, Casey’s Cove Diner and Crabbie Dad’s. If you’re scalloping out of Keaton Beach, Walter B’s on the Beach Road (CR361) is good for BBQ and light meals. And if you’re in St. Marks, try the Riverside Cafe or head a bit west to Posey’s or Hamaknockers’ in Panacea. Or head to Spring Creek for some great seafood at Spring Creek Restaurant. If you’re looking for lodging at short notice, especially before Labor Day, expect some disappointment. Places like the Shacks at the Sea Hag, Pelican Pointe at Fiddler’s, Steinhatchee Landing Resort, River Haven Motel, Good Times Motel as well as most condos and rentals in Steinhatchee-proper to be booked up. They’re usually sold out a year in advance. However, options are to stay in Perry (Hampton Inn or Holiday Inn Express) or Cross City (Putnam Lodge or Carriage Inn) At St. Marks, there are cabins at Shell Island Fish Camp but if they’re full, try the Wildwood Inn or Best Western in nearby Crawfordville.